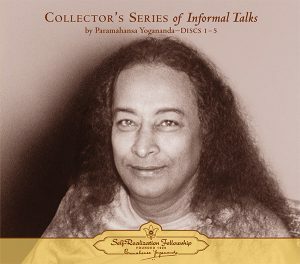 View cart “Collector’s Series of Informal talks – By Paramahansa Yogananda (Discs 1-5)” has been added to your cart. These rare recorded talks were taped during a gathering at Self-Realization Fellowship International Headquarters on Christmas Day, 1950. 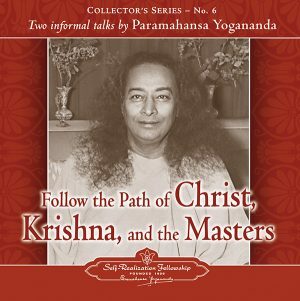 Paramahansa Yogananda inspires his lis­teners to a deeper understanding of the twofold path of highest spirituality: inner communion with God combined with serviceful activity in the world. The great Master’s words — and the subsequent talks by two of his advanced disciples, Rajarsi Janakananda and Dr. M. W. Lewis — give powerful testimony to the truth that the help and blessings of a true guru are ever available to all who inwardly attune themselves with his God-united consciousness — whether or not he is outwardly present. During the latter years of his life, having completed much of the outward organizational work he had been sent to the West to accomplish, Paramahansaji often spent long periods away from the day-to-day activities of the organization — devoting much time to completing his writings and remaining immersed in the highest states of samadhi, union with God. The 1950 Christmas season was one such period of seclusion; Paramahansaji stayed in his quarters at the SRF International Headquarters, but through a speaker system addressed the disciples and guests who were assembled downstairs. Since Paramahansaji was not in attendance, the traditional Christmas banquet was presided over by Rajarsi Janakananda (Mr. James J. Lynn, referred to by the Guru as “Saint Lynn”), whom he had designated to be his successor in leading Self-Realization Fellowship/Yogoda Satsanga Society of India after his passing. Another close disciple, Dr. M. W. Lewis (vice president of Self-Realization Fellowship until his passing in 1960), assisted Rajarsi in officiating at the festivities. Their talks follow Paramahansaji’s address. Though on this occasion the Guru’s words were directed pri­marily to his renunciant disciples — those who had dedicated their lives completely to seeking God and serving His work in the Self-Realization Fellowship monastic ashrams — the inspiring truths in his words of guidance are applicable by all. The original tape of these talks was made in less-than-ideal conditions, with only the relatively primitive recording technology available at that time. However, SRF monks have now painstakingly restored the original to the maximum degree possible with today’s state-of-the-art digital equip­ment. Though there are differences in sound quality throughout the talks, and some portions are not as clear as we would like, we felt that their inspi­ration and historical value made them all well worth presenting. After you have completed the checkout process, you will be given a link to download the audio files in mp3 format to your device. You will also receive this link in an email. The files in this download are zipped files. Copyright © 2005 Self-Realization Fellowship. ℗ 2002 Self-Realization Fellowship. All rights reserved. 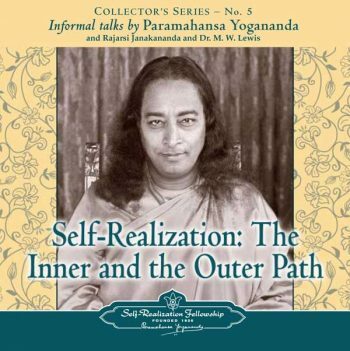 Paramahansa Yogananda (1893–1952) is widely regarded as one of the preeminent spiritual figures of our time. Born in northern India, he came to the United States in 1920, where for more than thirty years he taught India’s ancient philosophy and science of yoga meditation and the art of balanced spiritual living. The first great master of Yoga to live and teach in the West for an extended period of time, he traveled and lectured extensively throughout North America and abroad, speaking to capacity audiences in major cities and revealing the underlying unity of the world’s great religions. He has inspired millions through his acclaimed life story, Autobiography of a Yogi, his groundbreaking commentaries on the scriptures of East and West, and his numerous other books. 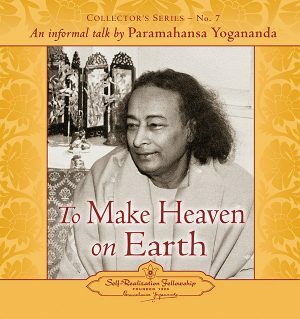 Paramahansa Yogananda’s spiritual and humanitarian work continues to be carried on today by Self-Realization Fellowship, the international society he founded in 1920 to disseminate his teachings worldwide.